Right from our childhood, we have been taught about the rich heritage of our country India. India is a home to many historic places which have gained recognition all over the world. The Pink City Jaipur is one such city which has hidden many exotic places in her heart. The city is full of famous forts, enchanting palaces and lovely temples which spread their serenity and divinity over our motherland. Already a popular tourist attraction, efforts are now being made to spread its glory by adding a new and modern touch to it. This is when Virtual Reality rushes to help. 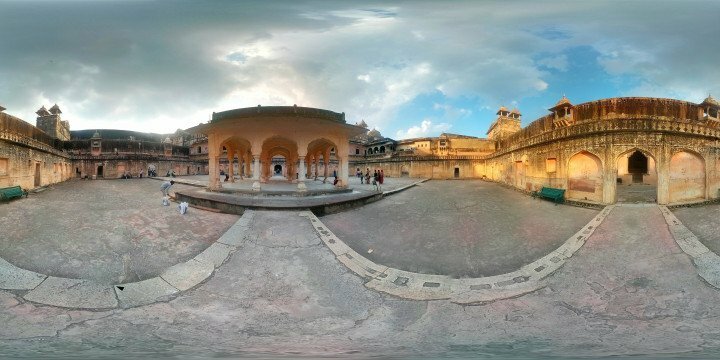 VR lovers who are ready with their backpacks to explore something adventurous can now head to Jaipur because Virtual Reality booths at some of the major tourist spots will soon be erected in the city. These booths will allow the user to explore their famous monuments through walk-throughs created in 3D. All you have to do is just sit at the booth, put on your Oculus Rift 3D headset -head mounted goggle and set your eyes on the screen before you, which will be connected to a PC and navigate the entire monument by using the navigation options. The Oculus Rift when connected, tracks the head movement and provide a 3D imagery on the OLED display. So hold on your excitement level as I read the list of the places you will explore while sitting at these booths. Here it goes- Hawa Mahal, Jantar Mantar, Sheesh Mahal, City Palace of Jaipur and Udaipur, Albert Hall Museum and the famous gates- Chandpol Gate, Ghat Gate, Sanganeri Gate, Suraj Pol Gate, Samrat Gate, New Gate and Zorawar Singh gate. While it is not possible for the travelers to explore their favorite destinations overtime due to lack of time, these virtual reality booths can be of great help as the travelers can take a quick view of their favorite places and even save a lot of time. This will also be helpful to promote the tourism of the country as more and more tourists would get attracted because of this new feature. Especially the younger generation who is quite tech-savvy and are crazy about VR. So the next time when you plan your mini vacay, you know where to head right?